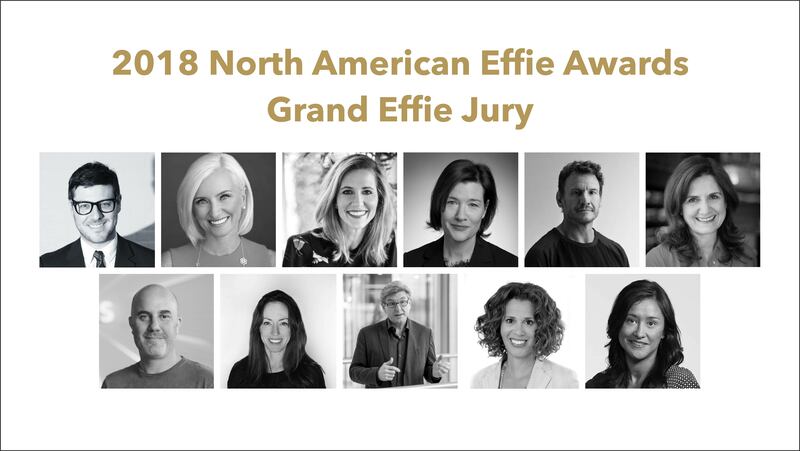 NEW YORK (May 3, 2018) -- Members of the 2018 North American Grand Effie Jury were announced today, Carolyn Everson, vice president of global marketing solutions, Facebook and Nick Law, chief creative officer of Publicis Group and president, Publicis Communications will serve as co-chairs. The 2018 Grand Effie Jury will select the North American Effie’s “best in show,” hours before the May 31 gala at Cipriani 42nd Street in New York. Since 1968, the Effie Awards have honored marketing effectiveness and are presented by Effie Worldwide. During the judging session, hosted by Oath, c-suite marketers will review and debate case studies of top scoring Gold Effie winners, which went through two rounds of judging to earn the distinction of Grand Effie contenders. The Grand Effie winner will receive additional points towards their North American Effie Rankings, which will be revealed at the end of the show. Their rankings will also contribute to next year’s Global Effie Index, which identifies and ranks the most effective agencies, marketers, brands, networks, and holding companies by analyzing credited finalist and winner data from Effie Award competitions around the world. Additional information on the jurors and their thoughts on building a culture of effectiveness at their organizations can be found on the Effie blog. Effie Worldwide is a 501 (c)(3) nonprofit organization that stands for effectiveness in marketing communications, spotlighting marketing ideas that work and encouraging thoughtful dialogue about the drivers of marketing effectiveness. The Effie network works with some of the top research and media organizations worldwide to bring its audience relevant and first-class insights into effective marketing strategy. The Effie Awards are known by advertisers and agencies globally as the pre-eminent award in the industry and recognize any and all forms of marketing communication that contribute to a brand's success. Since 1968, winning an Effie has become a global symbol of achievement. Today, Effie celebrates effectiveness worldwide with the Global Effie, regional Asia Pacific, Euro, Latin American, North American and Middle East / North Africa Effie programs and more than 40 national Effie programs. For more details, visit www.effie.org.